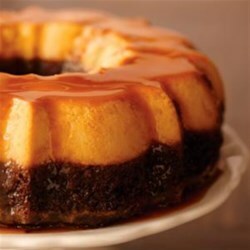 "This flan, when inverted, rests on a rich chocolate cake layer and is topped with melted caramel." Heat oven to 350 degrees F. Coat 12-cup fluted tube pan with no-stick cooking spray. Place piece of rolled up foil in tube of pan to prevent cake from baking over top. Pour caramel topping into prepared pan. Prepare cake mix according to package directions using the water, oil and eggs. Pour evenly over caramel topping. Combine cream cheese, eggs, sweetened condensed milk, evaporated milk and vanilla in blender container. Process until blended. Pour slowly over cake batter. NOTE: While baking, the cake rises and the milk mixture goes to the bottom. Coat piece of foil with no-stick cooking spray. Cover pan, coated side down, tightly with foil. Place pan in large roasting pan. Pour hot water into roasting pan to a depth of 2 inches. Bake 2 hours or until toothpick in center still has a few moist crumbs. Place cake on cooling rack. Cool 15 minutes. Remove foil and invert onto serving plate. Cool 1 hour at room temperature. Chill 4 hours or overnight. Be careful when inverting hot cake onto serving plate. Place plate upside down on top of pan, place another cooling rack on top, then invert. Wonderful! Did as the others suggested,left it in pan with water for 10 min and had no trouble taking it out. Family and friends loved it; will be making again very soon.